Indian railway jobs (IRJ) has published notification for station master ticket clerk vacancies. Interested & eligible candidates can read Notification & Apply online before the last date at www.indianrailways.gov.in. Note: This post Under RRB NTPC 2019 35277 Notification. There are various vacancies under RRB CEN 01/ 2019 NTPC check below. 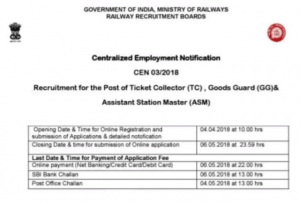 rrb postponed the Assistant station master and other posts on Notification number 3. 1 for RPF 2 for Group D and there up to 6 notifications release for aspirants. there is no official information to release this notification in a couple of next months. its delayed actually. Merit list prepared based on the above two exams.